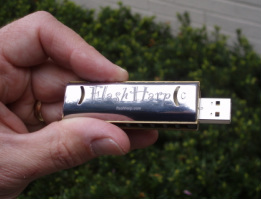 WGN News anchor Steve Sanders sound great playing FlashHarp on this 7/20/11 "Midday Fix." Clip above is courtesy of HGTV from 2010 Black-Friday special, "15 Fresh Handmade Gift Ideas." This just in from Mega Tech News! Engadget Germany (Sprechen Sie Deutsch)?